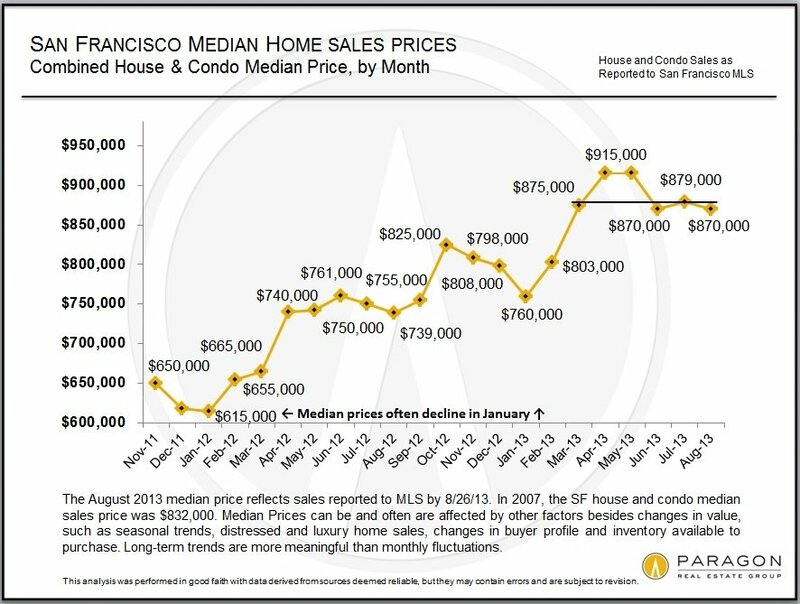 Note: Case-Shiller Home Price Indices for “San Francisco” are for a 5-county area, of which the city’s housing market is a very small part. 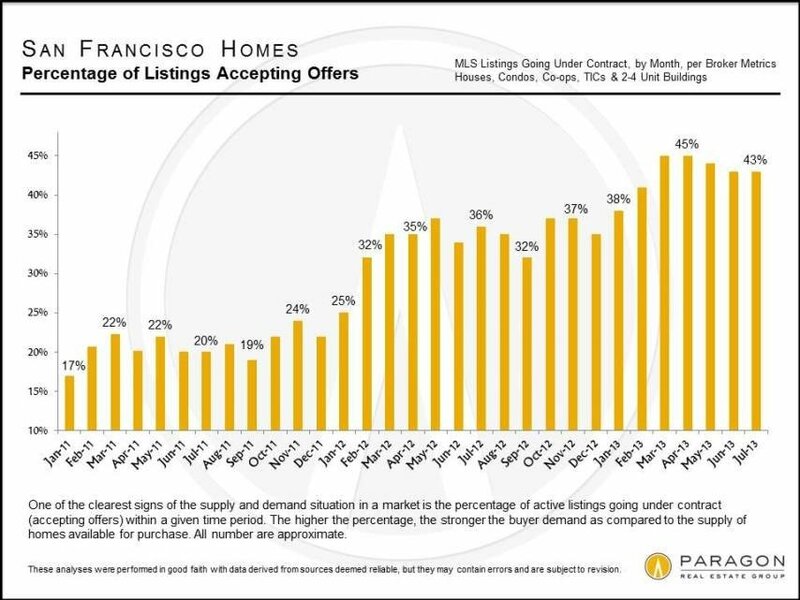 Since they are published 2 months after the month of the Index, are 3-month rolling averages, and the time between offer acceptance and closed sale typically runs 4-8 weeks, Case-Shiller is generally 3-6 months behind the market itself, i.e. when offers are being negotiated in the present. 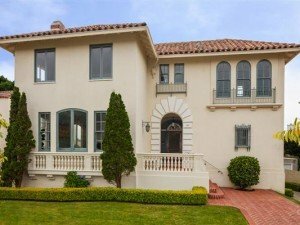 Case-Shiller publishes 4 main indices for SF Metro Area houses: an aggregate index for all price ranges, and then one index for each third of unit sales – low price, middle price and high price tiers. 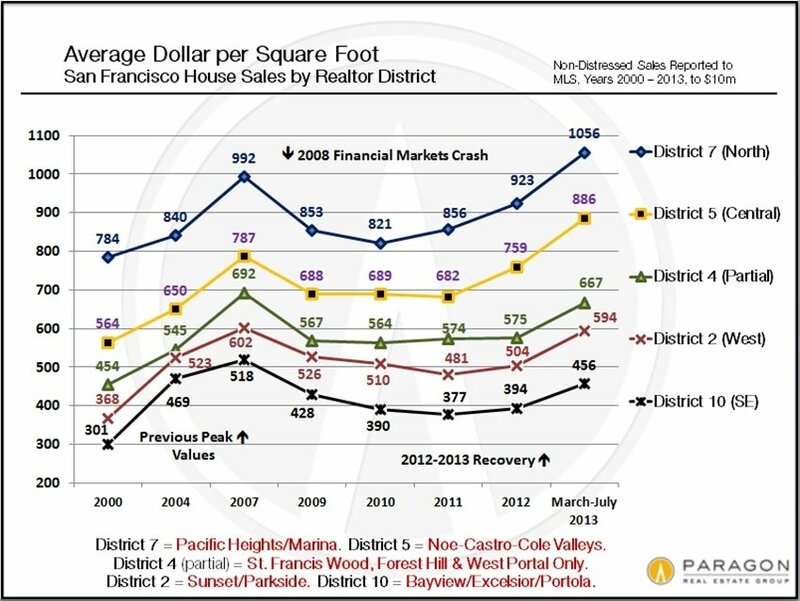 The June 2013 aggregate C-S Index (all price ranges) for the SF Metro Area is up approximately 2.7% from May, up 32% – 34% from its low point, but still approximately 20% below its peak in 2006. Please note that for a drop of 50% to be recouped, the increase must be 100%. When the market fell from its peak in 2006-early 2008 (different areas and different market segments peaked at different times), the scale of the decline varied widely, mostly by price point. 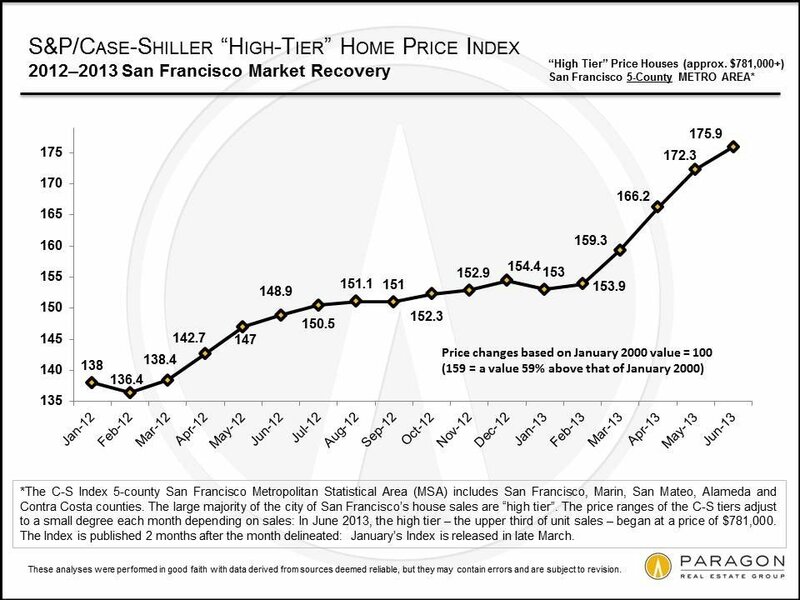 With the recovery that began in 2012 and has accelerated in 2013, the magnitude of the price recovery, as compared to previous peak values, has also varied by price point and area. 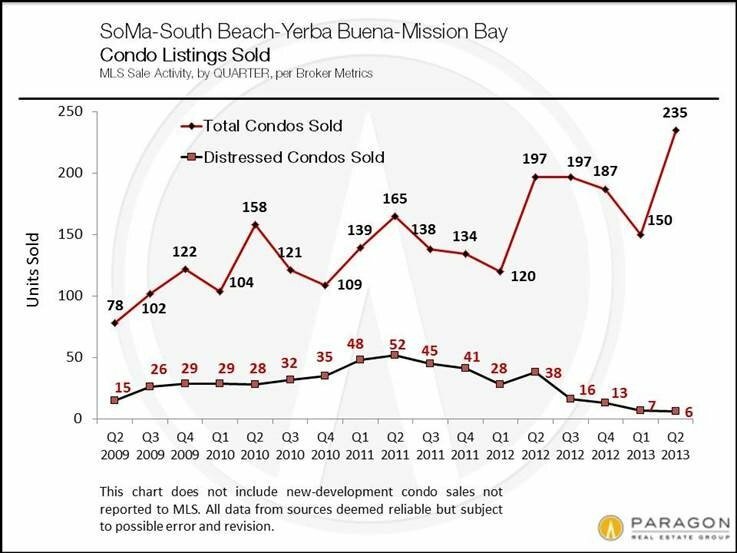 The lowest price range (deeply affected by foreclosures and distressed sales) fell most dramatically – an approximate 60% decline from its peak. It is now recovering dramatically on a percentage basis – up 45% from its low point – but is still about 40% below its 2006 peak. It has much more loss to make up. 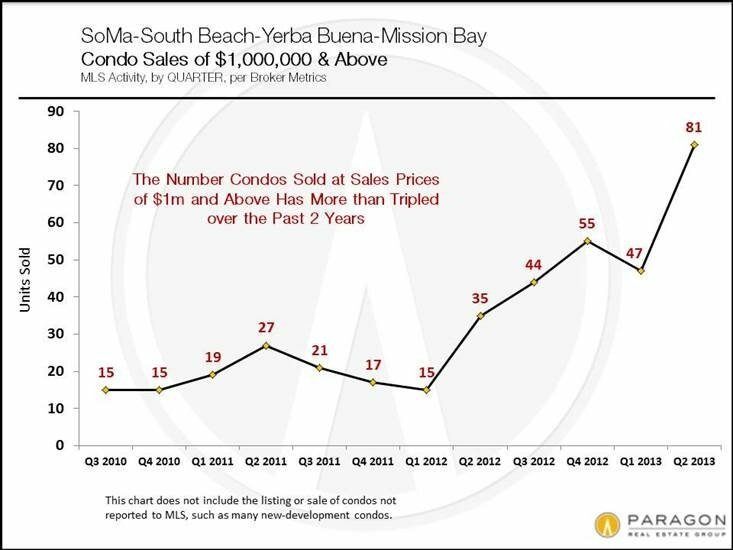 The upper price range (the top third of unit sales) in the 5-county metro area fell much less than the 2 lower price tiers (low and middle) during the bubble pop. On a percentage basis, it’s increase from its low point – about 27% — is not as great as for the lowest price tier, but is now getting close again to its previous peak value. 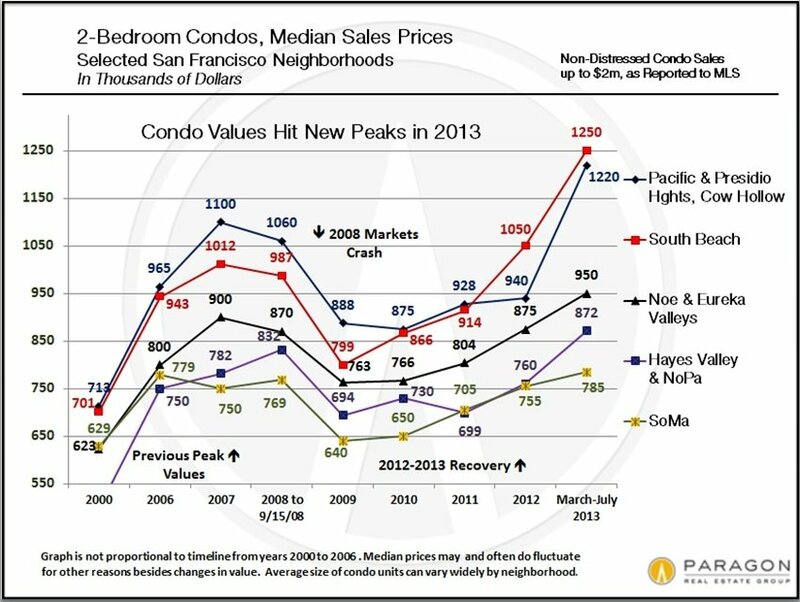 In the city of San Francisco itself, many neighborhoods have now reached or surpassed previous peak values reached in 2007-2008. This chart below illustrates the short-term monthly changes in the C-S high tier price index: the recovery in 2012 accelerating in 2013. May’s reading jumped 3.7% from April’s, and June’s was 2% above May’s, so the pace of acceleration seems to be slowing after a torrid spring. 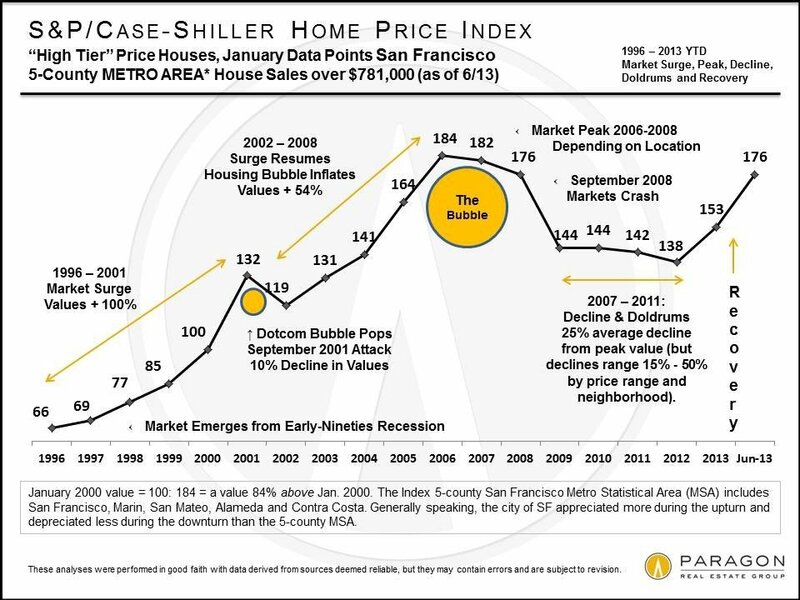 And then looking just at the city of San Francisco itself, which has, generally speaking, among the highest home prices in the 5-county metro area: many of its neighborhoods are now well past previous peak values. 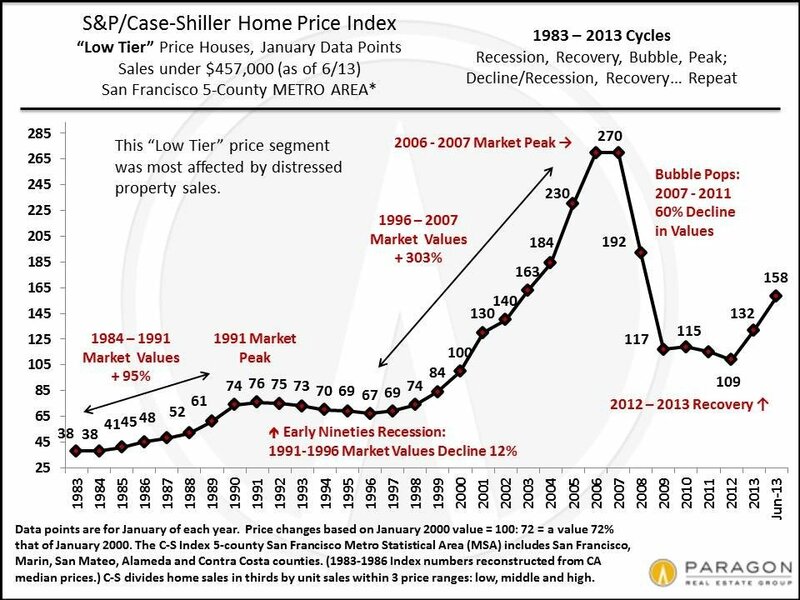 Note that this chart has more recent price appreciation data than available in the Case-Shiller Indices, and that median sales prices and C-S Index numbers do not correlate exactly. 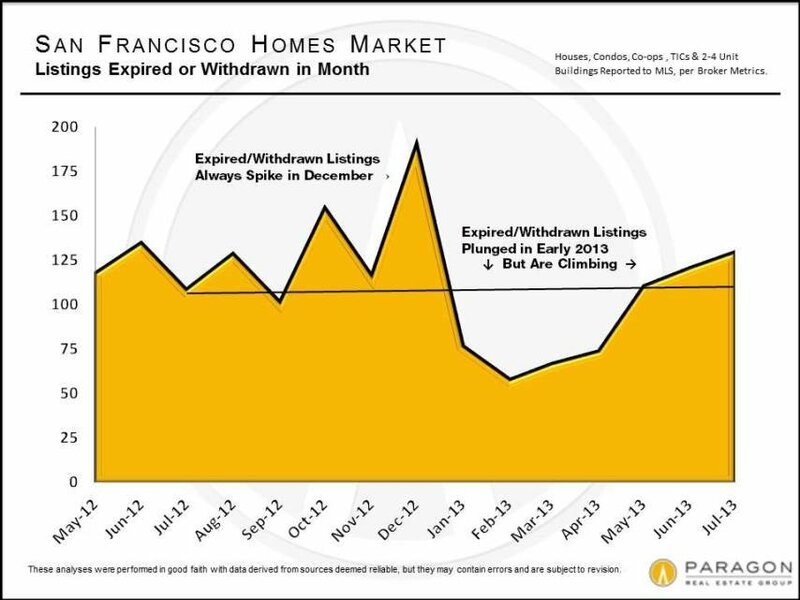 This chart implies that a plateau in home values has been reached in San Francisco: this could either be an indication of a stabilizing market or simply a seasonal plateau that sometimes occurs during the summer months for a variety of reasons, including that the higher-end home market has a greater tendency to withdraw from the market during the holidays. We shall have to wait and see what occurs when the autumn selling season begins after Labor Day. 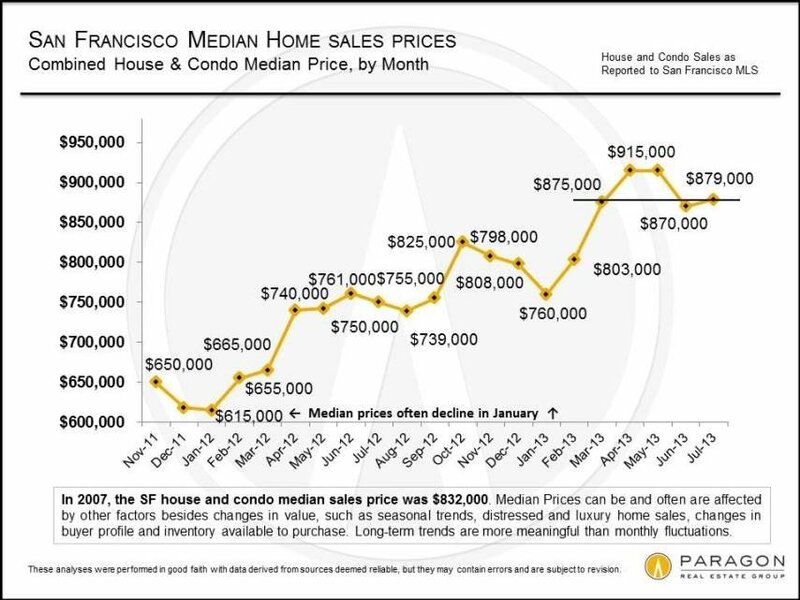 At the previous peak of the market, the combined house-condo median sales price in San Francisco was $832,000. 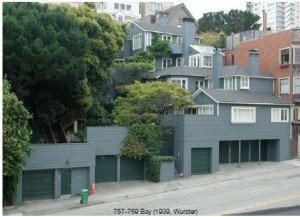 A companion to our recent overview on San Francisco Victorian and Edwardian architecture (Early SF Architecture): the text, chart and photos used herein are all courtesy and permission of the San Francisco architect James Dixon: James Dixon Website. We are most grateful for his generosity in allowing us to use them. 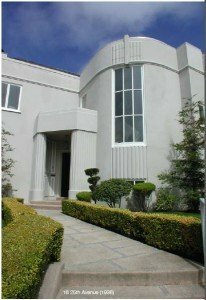 Art Deco takes its name from the International Exposition of Modern Decorative and Industrial Arts held in Paris in 1925. This new style rejected aristocracy for democracy, frugality for luxury, and European architectural references for futuristic geometric ornament. It is a decorative style of applied ornamentation, and its features include geometric ornament of zigzags, chevrons, sunbursts, and florals; and use of exotic architectural references, such as of Mayan temples and ancient Egypt. Mies van der Rohe’s maxim “Less is more” appropriately expresses this lean and functional style. Mies was one of three gifted architects who learned functional design from the industrial architect Peter Behrens; the other two were Le Corbusier and Walter Gropius. In 1923 Corbusier published “Towards an Architecture”. It set modern engineering and unadorned honesty, pure function and pure form, as the only true standards of architecture. 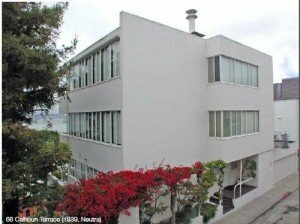 Corbusier’s most famous dictum, “A house is a machine for living” still influences architects today. Characteristics include no ornamentation, windows flush with walls, no trim on doors or windows, functionally efficient open floor plan and flat roof. 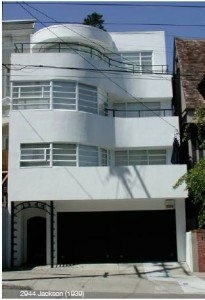 Art Deco was a transport to another time-an exuberant fantasy future or an exotic past-while Streamline Moderne was a transport to another place. It was a romance of efficient travel by ocean liner, airplane, train and car. This new science of aerodynamics rounded edges, assisted air flow around corners with horizontal grooves, and smoothed surfaces so they were unencumbered and sleek. Buildings became romantic ships and airplanes to and from another place. Characteristics include curved corners; the use of glass block; corner and porthole windows; and other elements of nautical or aerodynamic flair. 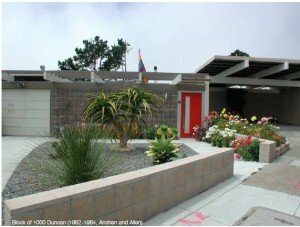 Bay Area Modernism influenced more homes throughout America than all other architectural styles combined, as seen in the vast tracts of post-World War II suburban ranch houses. Architect William Wurster combined a love of California landscapes and its rural buildings (wood-sheathed farmhouses, barns and sheds) with the elemental quality of minimalist Japanese architecture. The goal was inexpensive homes that allowed the outside in and were easily built of local, natural materials. 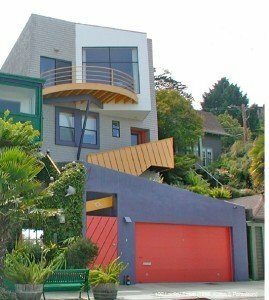 As the Second Bay Area Style matured, architects tired of its plainness and flirted with playful pop culture and Postmodernism. They started the Third Bay Area Style and influenced acres of tract homes throughout the United States. Joseph Eichler was a visionary developer who built over 11,000 homes in California. All his homes would display Frank Lloyd Wright’s core ideas: “breaking the box”, “bringing the outside in”, floor to ceiling glass, simple natural materials kept exposed, and the open floor plan. These ideas made Eichler homes airy and modern. To Mies van der Rohe’s modernist maxim “less is more” architect Robert Venturi famously riposted “Less is a bore.” Venturi’s 1966 book “Complexity and Contradiction in Architecture” rejected International Style modernism and, at its best, freed architects to borrow freely across architectural styles. At its worst it allowed fake historical ornament pasted to boring boxes and intentionally jarring juxtapositions of different architectural styles. These buildings use modern materials, technology and computer modeling, yet strive to be humane – a radical concept in modern architecture that up to this point had revered machines, not humanity, and had rejected nature, not embraced it. Humane Modernism’s aesthetic is contemporary, but it is warm, tactile, colorful and durable. It uses the best traditional building methods to increase the everyday quality of life of the inhabitant-such as local sustainable materials beautifully detailed and exposed to view, as well as the common incorporation of “green building” features. 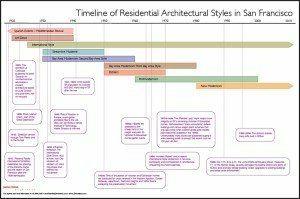 Here is a nifty timeline of San Francisco’s variety of modern architectural styles. 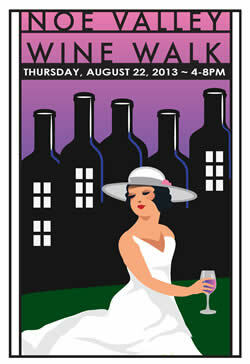 The 3rd Annual Noe Valley Wine Walk on Thursday, August 22nd, 2013 is a unique and affordable event staged along the stretch of artsy shops, intimate restaurants, friendly bars and cafes. Victorian houses have been converted into a neighborhood full of organic produce, smoothies, new age music and paint-it-yourself pottery stores that will, during the Wine Walk, offer wine samples, finger foods and special treats. Experience the flavor of Noe Valley and take advantage of the free cable car shuttle making designated stops to pick up and drop off attendees during the event. The tasting event will be located throughout 24th Street from Diamond to Chattanooga, 4:00 to 8:00 PM. Look for Wine Walk signs posted on location fronts indicating participating businesses. Admission fees include a souvenir tasting glass for bottomless tasting during the event. A changing market? 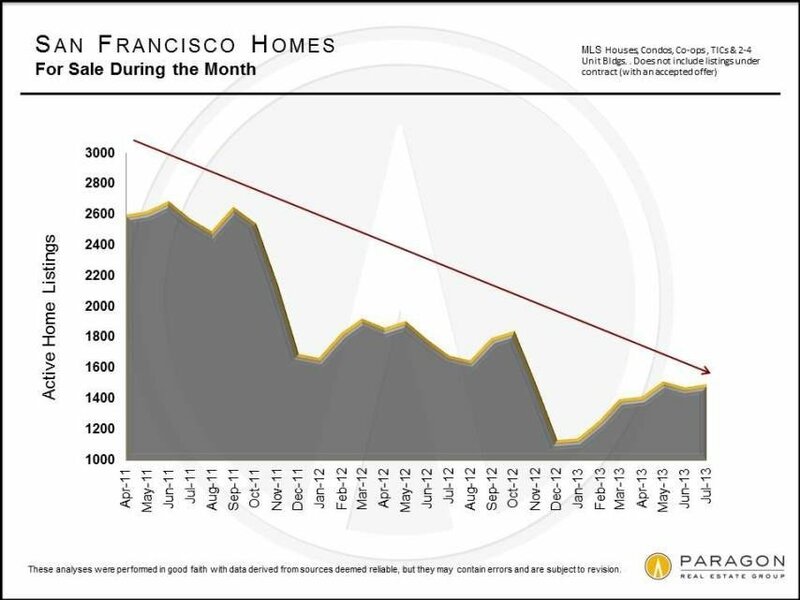 Have SF home prices reached a plateau? 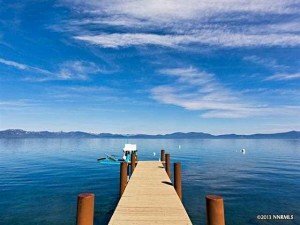 The market usually does slow down at least a little in mid-summer – a question has come up: is this possible slowdown caused by listing agents continually pushing the envelope on pricing for new listings or pricing to the last, highest, frenzied sale, a move that buyers are now finally starting to resist? It may be, that without buyer demand really slackening for homes deemed “reasonably” priced, we have come to a point, at least for the time being, that buyers are no longer willing to pay new tippet-top peak prices. Have prices reached a plateau? Monthly median price stats are subject to fluctuation without great meaningfulness (which is why I prefer quarterly or longer periods), but after the big jump early in the year, the median sales price has been within a 4-5% spread (not a huge spread for monthly home prices) for 5 months, Including a drop from April-May. 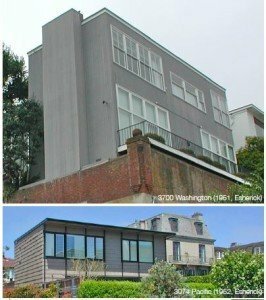 The idea of a plateau contradicts the recent Case-Shiller Index report, but the Index is about 3-5 months behind current realities, San Francisco is only a tiny part of the Index and the city has outperformed C-S since the turnaround began – having appreciated so much faster than other places, we may be due a flattening of appreciation before other areas. And that also may be true for different SF neighborhoods – since they have rebounded at different speeds, some may be plateauing and others are still appreciating. 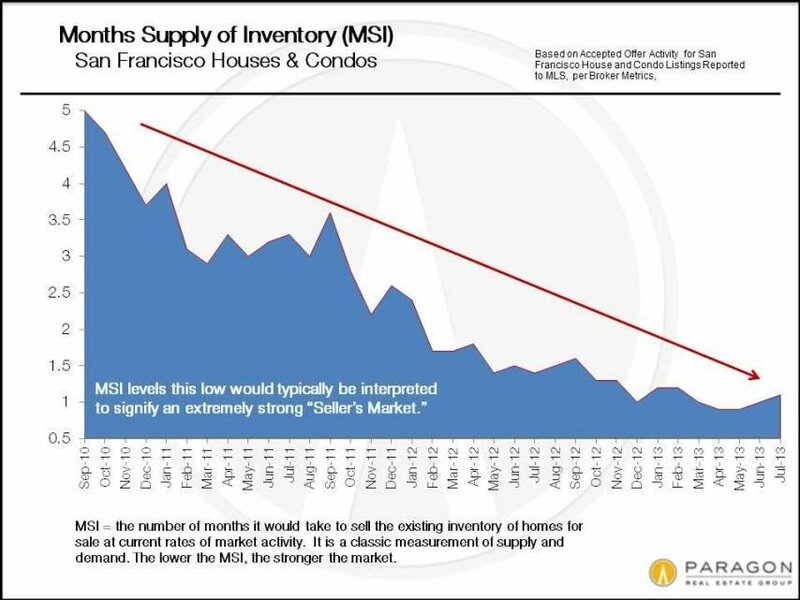 At this point, this is speculation and it won’t be clear for a while – these things only become clear in retrospect – because spring median prices sometimes spike and summer prices drop a little as some of the higher end market checks out for the holidays. And median sales prices are not perfect correlations of changes in market value, being affected by a number of other factors, including seasonality. 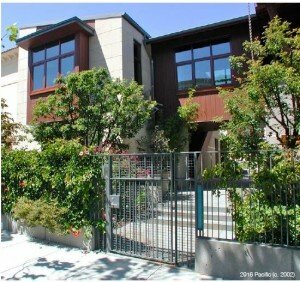 Anecdotally, we are hearing stories of the market not responding to homes priced at the top (even if “justified” by another recent sale), and also stories in which the winning bidder offered a huge amount, sometimes hundreds of thousands of dollars, more than what the second highest buyer was willing to pay – i.e. the winning buyer ultimately paid much more than necessary to win the deal. The number of expired/withdrawn listings is also increasing, though not to some crazy level yet. So it’s worth considering, that we “may” have reached a plateau or bumped into a ceiling, transitioning into a somewhat different market. If we are in a transition, the market will be schizophrenic for a while: some buyers acting one way and another growing group of buyers acting another. 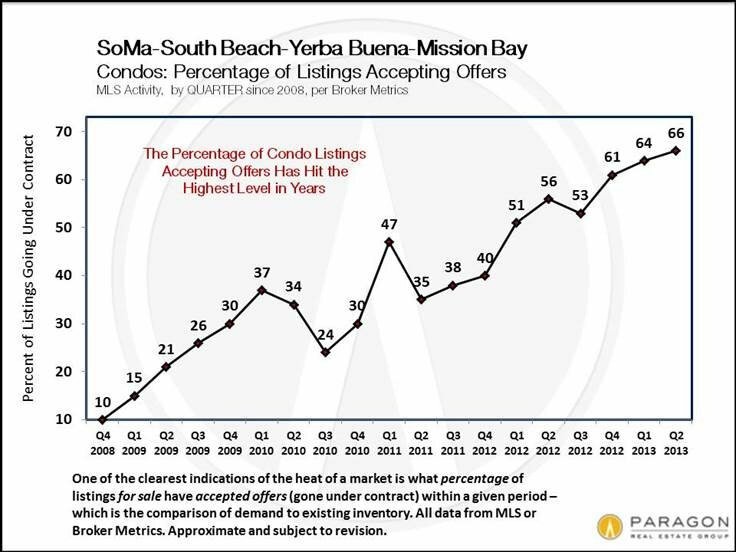 Buyer demand is still extremely high as measured by Percentage of Listings Accepting Offers. 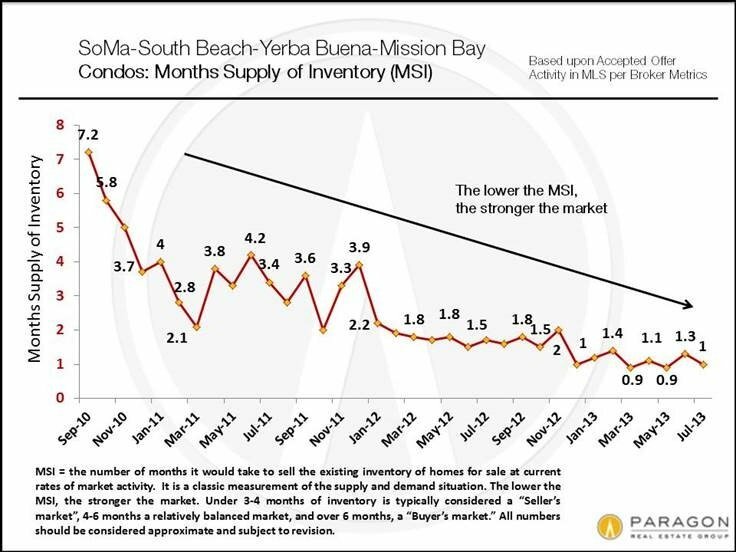 Inventory is still extremely low as measured by Months Supply of Inventory and Units for Sale. 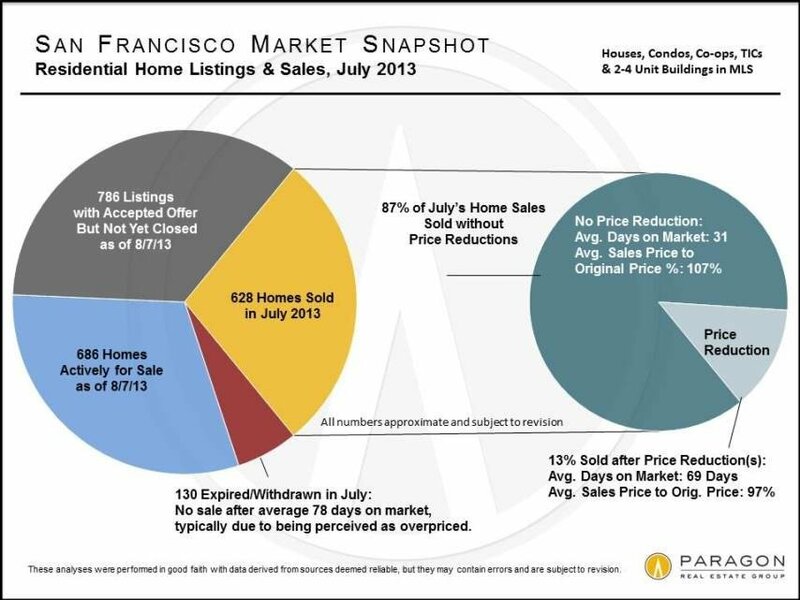 The number of Expired & Withdrawn listings climbed in July and was about 19% higher than July of 2012 (though less than half the number of July 2011). The main reason why listings expire or are withdrawn from the market is that buyers have concluded they are priced too high. The July snapshot makes it clear that the market is still very strong by any reasonable measure, even if it might be on the cusp of a transition to a somewhat less fevered state.